The BPMN specification presents lots of technical definitions and rules, but it does not teach you how to create process models that are effective in their primary mission – maximizing shared understanding of the as-is or to-be process. To do process modeling effectively, GenMyModel provides you a wide range of tools and features. In this post, we present 6 tips to take advantage of our BPMN design environment. Starting from scratch is usually a hassle. Get a starting point by browsing the public GenMyModel BPMN model repository. There might be a good example to start with for your business. Every day as our community grows, GenMyModel user’s create public professional models, available in this hub. Fork any public BPMN diagram and adapt it to your needs. IT people always bootstrap their code. Why don’t you bootstrap your process designs using our model repository? We all know that a “process design” is also a “communication support” and it’s sometimes difficult to share ideas and discuss about a complex static model. GenMyModel offers you the opportunity to animate the designed processes. You can “play” the process, start and stop it or use this feature as a very simple visual demo. Read more about GenMyModel process animation. GenMyModel now supports you for different stages of collaborative business modeling. The decision diagram editor enables you to define the decisions to be made in the BPMN tasks while the decision logic tables helps you define the required decisions in sufficient detail to allow validation and automation. GenMyModel is one of the first BPMN tools implementing a professional DMN editor. Creating tags and versions – just as you would for a software program – is the easiest way to manage and secure your work. GenMyModel enables you to safely store all versions of your designed models with both the model information and the graphical representation (e.g. layout). All model can be tagged with a description and a version type. All versions are kept in our servers and they can be viewed and restored at anytime. Retrieve old versions to better understand the changes that occurred in your business processes. Read more about BPMN model versioning. To be more effective across teams, you might design your business processes collaboratively. Need to organize a modeling session with your teammates? You should try the first cloud-based BPMN 2.0 modeler integrating a Google Drive-style real time edition. You can also use the chat for smooth interactions. At anytime, you know who is in the workplace and what tasks your teammates are working on. Professional modeling works may require secure accesses and the modification of critical models. In this case, create an organization within GenMyModel, invite collaborators and manage their rights. Read more about access right management in GenMyModel. A complete business application needs to be built with processes and data. 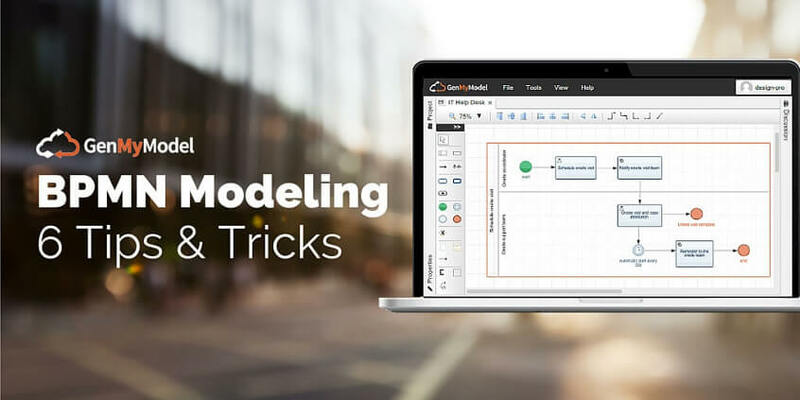 Did you know that GenMyModel is one of the first tools providing data modeling – within a BPMN project – in the cloud? No need to switch from one tool to another, you get all the modeling artefacts at the same place. This can help you bridge the gap between the business teams and the IT teams. Read our blog post about data modeling in our BPMN modeler.